pretty.pretty.paper: tiny posts for my ears. i've been thinking a lot about posts lately too. i've had my ears pierced since i was an infant, but i've always thought i looked silly in anything that dangles. posts are definitely the way to go. and you can wear them always without having to worry about them ripping right out. i like jewelry you can wear always. 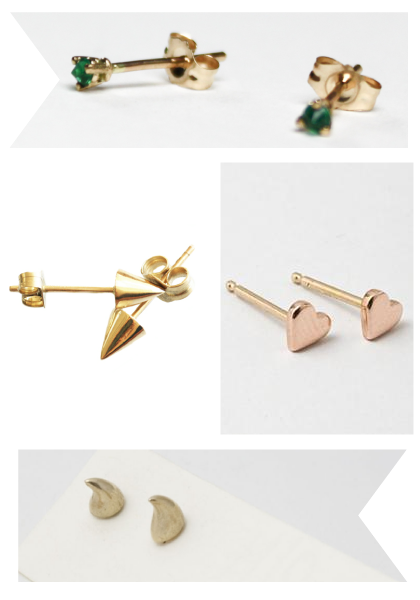 i wrote a post today about every day earrings too! i just got two awesome, inexpensive pairs. i was pining over all of mociun's posts, but they aren't quite in my budget. i love posts. they're perfect. those tiny emeralds are beautiful, but i've been stuck on the new catbird hearts since i saw them. either/or! I'm a big studs fan for earrings. They match all your outfits and every hair style! No?